Since I was planning on running some shorter races and maybe get on the track this summer, this first time race looked like something fun to do so I added it to the calender. I haven't really had much time to prepare with any speededwork but I got in two pretty good track sessions the past couple of weeks that went well so I was really getting excited as race day approached. Not having raced a mile since 1999 I was a little anxious and with the downhill I really didn't know what to expect other than the strain of racing nearly all out for 6+ minutes. My last mile race in 1999 was a 6:32 and I was hoping to beat that and had a goal of maybe 6:25 and a 6:20 would just be awesome. I arrived early and was happy to see that it was going to be a cool 70f, overcast and a slight tailwind. Really couldn't ask for better conditions ! I chatted with a few friends while I waited for my training partner Laura to show up. She seemed as excited as I was and was bringing all 3 kids to be my cheering squad. As soon as they arrived I headed out to do my usual warmup routine while they headed out onto the course. The womens race was at 7 and then we men would go at 7:20. I watched the women start and then headed out for some last minute strides. As I lined up with the 81 other competitors I was gettting a bit nervous.This is going to hurt ! I know most of these guys are ones that specialize in the faster stuff and I really don't want to get caught up in going out too fast. There doesn't appear to be too many in my age group but looks can be deceiving. I only recognize one that I have competed against but I am not sure if he has turn 60 yet. So this is what goes on in my mind. After the false start that is ! Yep, the gun malfunctioned. Boom, and we're off. Get up to speed. Wow, everyone is going out fast ! Don't go crazy. There goes Tim. Well unless he falls down or crashes hard I'm not going to beat him. Hope he isn't 60 yet. 100 meters and I glance at the garmin. Whoa, 5:15 pace? Doesn't feel that fast and I know its not reliable for current pace but I decide to back off just a little. It seems like no time and I can hear Isabella screaming go Joey from the 1/4 mile mark well before I get there. I am so happy to have her there and as I aproach the mark I give her a wave and then hear the split, 1:29. Woohoo, this is great, I'm feeling pretty good and well ahead of my goal. Bella takes off running along the side walk still screaming go Joey go. I glance over and she just keeps running along and cheering. This is awesome. I'm on cruise control now and settled into a pace I am hoping I can hold and in what seems no time there is Laura and Sophia up ahead cheering for me. I am smiling inside and I wave and see Laura is snapping pictures of course. As I passed the half mile split in 2:58, I think I tried to yell out sub 6 to her but I'm not really sure if the words came out between the hard breathing. And just as I remember, the 3rd 400 is the hardest for me to hold pace. Halfway home but the effort is getting harder and harder. I concentrate on just trying to maintain while fighting off the fears of tying up or crashing. No, I'm going to do this ! Just go. I finally approach the 3/4 mark and I see Julian up ahead cheering me on. The visual I have at this point is that he seems to be uphill ! I see Jon Odgers just past him but I am trying to figure out where the split marker is and who is the one calling out times. Finally I hear a guy calling times and it looks like about 4:32. Slowing down and that miracle sub 6 is gone. But only a qtr mile to go so dig deep ! I see Tim up ahead. No way I can catch him. But wait, I think I have closed the gap a little ! Go, but wait, less than a qtr to go there is no way I'm catching up but just go hard anyway ! I round the curve and I can see the finish and I get tunnel vision. I keep hearing voices calling my name but I don't know who they are. I'm just focusing on that finish and going as hard as I can. I glance at my watch. Nope, no sub 6 but then 50 yards later I see the official clock and for a brief moment I think if I can sprint I got it. But no, just a little too far but it doesn't matter ! I am crushing my goal ! I strain for every second and I hear footsteps behind me but I just push harder and there it is ! 6:04 !!! 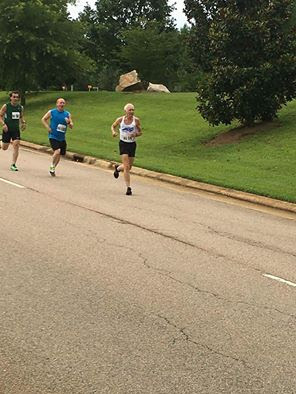 I glance back and the footsteps I heard just happened to be the guy I suspected was in my age group just 3 seconds back and he immediately comes over to congratulate me. As Louise Guardino mentioned in the report I was so happy I was dancing. After I quit gasping that is. I hang around for a few minutes talkng with friends and then begin jogging back up the course to find Laura and kids. They are all excited and she is dying to hear the time. Quite a few people have be telling her I went 6:0X and I am just grinning so hard as I tell her. It wasn't later until I was at the awards that I found out I did indeed win the 1st place Senior Grandmaster award. Turns out it was just me and the guy 3 seconds back in our division ! I couldnt be any happier with the results and that the body held togethern in this all out effort. And it was so wonderful having my #1 cheering squad there for me.